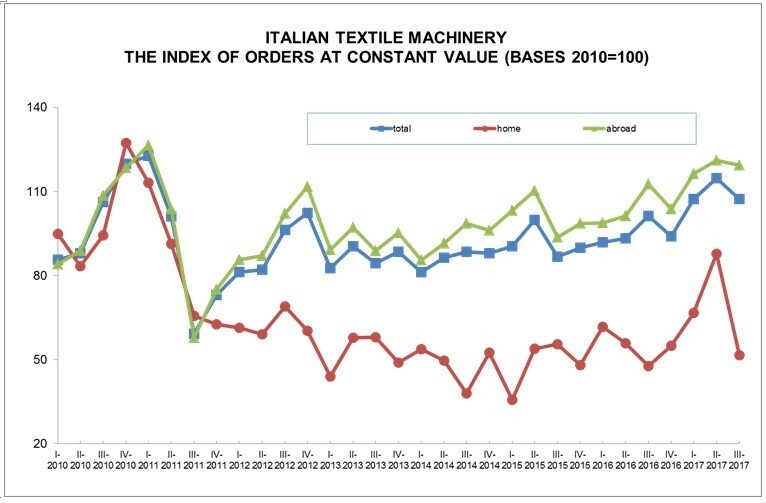 According to data elaborated by ACIMIT, the Association Italian Textile Machinery Manufacturers for the period from July to September, the orders index for textile machinery has risen by 6% compared to the same period in 2016. The index has a value of 107.3 points (2010 basis = 100). In further detail, foreign markets have shown a 6% increase, with the index reaching a value of 119.4 points. As for Italy’s domestic front, the increase instead amounted to 8%, with an absolute value for the index of 51.5 points. “Orders have continued their growth trend, making us confident that we will close out the year on a positive note,” commented ACIMIT president Alessandro Zucchi. The primary foreign markets for Italian textile machinery have elicited a constant demand, while growth has been ongoing for Italy’s domestic market, even if at a lower overall rhythm compared to the quarter from April to June. “The measures relating to Industry 4.0, as envisaged in the upcoming Financial Budget Law, could very well keep the trend alive towards the digitalization process necessary for the entire Italian textile sector,” confirmed Zucchi. ACIMIT, represents an industrial sector comprising around 300 manufacturers (employing close to 12,000 people) and producing machinery for an overall value of about 2.7 billion euros, with exports amounting to more than 85% of total sales (http://www.acimit.it). Creativity, sustainable technology, reliability and quality are the characteristics which have made Italy a global leader in the manufacturing of textile machinery.